We've all received them. Big. Small. The obvious, and the unnoticed. But constantly, daily, we are being blessed by our Father in Heaven. He is giving us those things which we stand in need of. Sure there are times that we feel far from blessed...those times of difficulty and struggle. The times when things aren't turning out just like we think they should. In those moments, we must remember that God loves us deeply and completely, and because of this He will always do what is best for us, giving us what we need, rather than what we want. Those two things, may be very different. Nevertheless, let us remember that He is blessing us. During those times that we may not feel so blessed, let us remember the words of Marion G Romney, he said "Gratitude is not a courtesy, but a commandment." When we are thankful...When our hearts are filled with gratitude...When we see the haves, rather than the have nots...That is when we are happiest. It is when we are able to feel peace. Gratitude is a vehicle that brings us closer to Him. Then there are the times that the blessings flow so abundantly and obviously, and we are overwhelmed and humbled by what we are receiving, wondering what we ever did to deserve such goodness and grace. 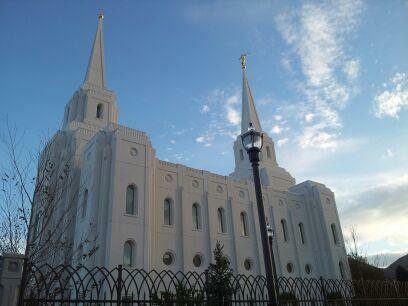 Seeing this magnificent sight brought to mind the words of President Hinckley, "Be grateful. Be thankful to the Almighty for His wonderful blessings upon you. You have all that this great age has to offer, and beyond that the marvelous blessings of the restored Gospel of Jesus Christ. How lucky can you be. Walk with appreciation and respect for the blessings of life and happiness which you enjoy." "...he doth require that ye should do as he hath commanded you; for which if ye do, he doth immediately bless you; and therefore he hath paid you. And ye are still indebted to him, and are, and will be, forever and ever; therefore, of what have ye to boast?"